He was born on October 17, 1936 in Shuruk village of Lankaran region. But he received his secondary education in Astara. In 1957 graduated from the Medical School and was appointed to the military hospital of Lankaran where he started his career. In 1967, he started working as a physiotherapist and then as a radiographer-technician. Soltanaga Bayramov won the deep respect of the staff working at the hospital during the time he worked there. Everyone knew him as a caring, principled, law-abiding and fair a man. He won the title of "A (excellent) Health". Soltanaga Bayramov had a great labor on the recovery of many soldiers of our national Army, and helping them to return to active life. In 1990 our people were most probably faced with the toughest test – Patronage of foreign countries and internal enemies: Those ungrateful traitors were ready for all sorts of vile actions against our country in order to dismember the republic. Living with a dream to create "Talysh-mugan Republic", Alikram Humbatov and his gang had committed serious crimes in southern region of Azerbaijan. Soltanaga became a victim of separatist group and of their unfair personal ambitions, and as many other doctors, he suffered also because of those unjust actions. But the brave sons of Azerbaijan by enduring all these difficulties were able to destroy them. As a result of loyalty in the hearts of the people towards the Motherland, the operation went well and, they adequately fulfilled their patriotic duty. When the bandits attacked the hospital, they had a serious resistance by the military hospital and Soltanaga Bayramov one of the sons of the motherland to fight bravely against the intruders. On 23 of August, 1993the fighting took his life. Unfortunately he was tragically killed. By decree no. 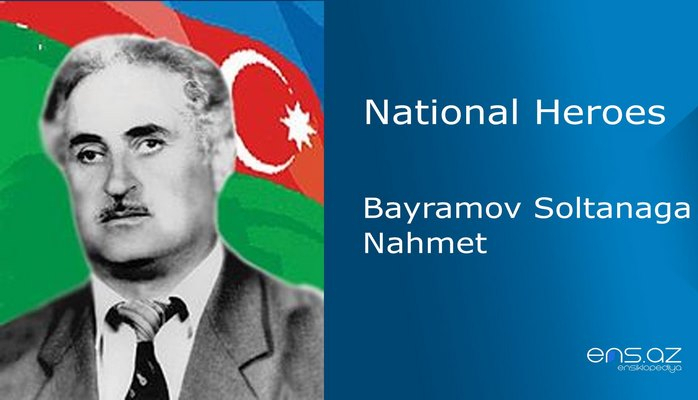 740 of the president of the Azerbaijan Republic dated august 24, 1993 he was posthumously awarded the title of "National Hero of Azerbaijan". Bayramov Soltanaga Nahmet was buried in the alley of Martyrs in Lankaran. One of the streets in the city of Lankaran city was named after him and there is also a memorial plaque and a bust in front of the building where he used to live.